Trump holds up a proclamation declaring his intention to withdraw from the Iran nuclear agreement. PARIS -- European leaders sought to salvage the nuclear pact with Iran on Wednesday after President Donald Trump pulled the U.S. out of the accord, threatening big investments in the Iranian market by companies including PSA Group and Renault. PSA said it hopes the European Union will adopt a common position on Iran, following President Donald Trump's decision to pull the U.S. out of a nuclear deal with the country. "Like other economic players, we are following the evolution of the matter, and are also following the EU's official position on this topic," a PSA spokesman said, adding that the automaker hopes the EU's position regarding Iran will be a "singular" one. France has had close business ties with Iran since before the fall of the Shah in 1979, and has been rebuilding them after a 2015 deal with world powers saw international sanctions lifted in return for curbs on Tehran's nuclear activities. French automakers PSA and Renault have pushed hard into Iran. PSA has signed production deals worth 700 million euros to reclaim the leading position it once enjoyed in the market, while Renault invested to increase its production capacity to 350,000 vehicles a year. France's foreign minister, Jean-Yves Le Drian, said on Wednesday the Iran deal was not dead, and French President Emmanuel Macron would speak to his Iranian counterpart Hassan Rouhani. Macron's meeting would be followed by high-level talks between the Iranians and Britain and Germany, as well as France, Le Drian said. Trump's decision to exit the deal throws plans for billions of dollars of investments by European companies into disarray. Companies are not allowed to strike new deals in the Iranian oil and energy sector as of Wednesday. By August, transactions in Iranian government debt or currency and purchases involving the country’s automobile sector or Iranian gold and other metals must end. In November, deals involving Iran’s oil and energy sector, shipping and ports, and insurance services will be prohibited. 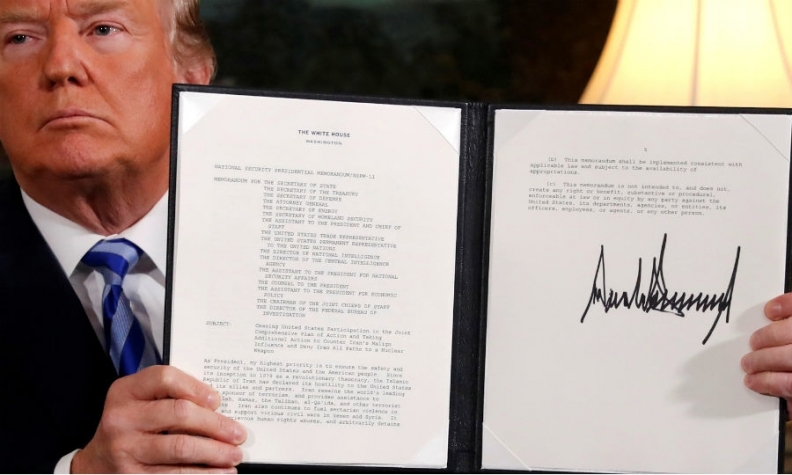 The 2015 agreement, worked out by the U.S., France, Germany, Britain, Russia, China and Iran, lifted sanctions on Iran in exchange for Tehran limiting its nuclear program. The pact was designed to prevent Iran from obtaining a nuclear bomb. Trump said on Tuesday that the agreement was "a horrible one-sided deal that should have never, ever been made." Other countries that helped Iran develop its nuclear program would also face sanctions, he said. Trump has complained that the deal doesn’t address threats from Iran’s ballistic missile program or its involvement in fomenting regional conflicts, and that provisions of the deal that expire in the next decade would allow Iran to resume nuclear work. He said that because of limits on international inspectors, they are “not able to prevent, detect or punish cheating” by Iran and “don’t have the unqualified right to inspect many important locations” including military bases. The U.S. Treasury Department said in a statement that sanctions would be reinstated after “wind-down periods” of 90 or 180 days. Nuclear-related sanctions that had been waived under the deal would take full effect after Nov. 4, the department said. It is unclear what may unfold following the U.S. withdrawal. American and European diplomats have sought to negotiate side agreements aimed at addressing Trump’s concerns about the deal, and the delay in reinstating sanctions may allow those talks to continue -- a prospect that Iran’s ally Russia, a party to the accord, raised ahead of Trump’s announcement.